Reeds Gap State Park is a 220 acres (89 ha) Pennsylvania state park in Armagh Township, Mifflin County, Pennsylvania in the United States. The park is largely a wilderness area with large white pine and hemlock trees. Honey Creek flows through the park, providing a habitat for trout. Reeds Gap State Park is 7 miles (11 km) from U.S. Route 322 near Milroy in New Lancaster Valley and Bald Eagle State Forest. Reeds Gap is a natural water gap, a geologic formation caused by Honey Creek in a Ridge, Hightop. This water gap was a natural gathering location for wild animals and it became a hunting ground for Native Americans and later the European settlers. These settlers named the area New Lancaster Valley. The gap became a gathering area for the homesteaders in the Mifflin County area. They gathered at the gap for bush meetings to listen to traveling evangelists and enjoy community fellowship. These meetings lasted until the 1920s. 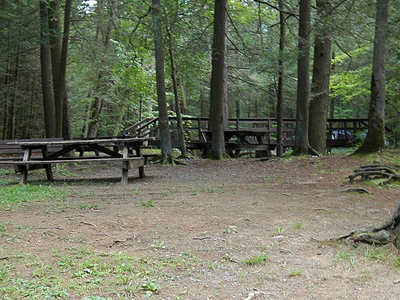 Here's the our members favorite photos of "State Parks in Pennsylvania". Upload your photo of Reeds Gap State Park!